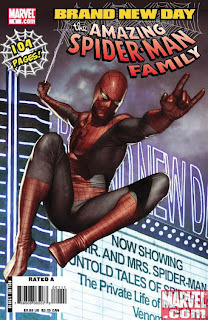 Marvel is proud to announce that Amazing Spider-Man Family #1 has sold out at Diamond! Not getting your dose of web-slinging fun, thricely? Check out Amazing Spider-Man Family #1 for the latest scoop on your friendly neighborhood super hero and the rest of the Brand New Day cast! Everyone knows Spider-Man's origin - but, no one knows what happened the day after Uncle Ben died. Join J.M. De Matteis and the Spanish sensation Alex Cal for "Spider-Man: 48 Hours"! Plus, the Amazing Spider-Girl team of Tom DeFalco, Ron Frenz and Sal Buscema show what MayDay was like before she became Spider-Girl! Also, what's up with Aunt May, Agent of F.E.A.S.T.? And a flashback to the birth of one Spidey's greatest nemeses, VENOM! Please note that Marvel currently has no plans to go back to press on Amazing Spider-Man Family #1 and copies may still be available at the retail level.